Top Gear's Jeremy Clarkson repeatedly rolled the three-wheeled Robin reliant in a stunt this season to great comedic effect. 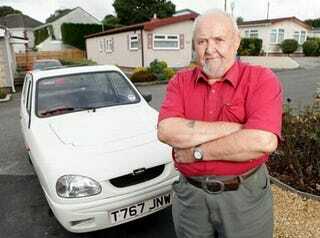 It wasn't so funny when hooligans decided after watching the episode they'd flip 78-year-old Barry Cloughton's Reliant — twice. The retired Cloughton's hopping mad about the whole incident, having driven Reliant's for forty-some years and bought one of the last cars to roll off the line. The first incident occurred just three hours after the episode of Top Gear first aired on June 27th of this year. Cloughton walked out to find his car lying on its side, with a scraped door, broken handle and broken mirror with fuel leaking all over the place. Police righted the car and paramedics had to be called to calm Cloughton down. It would have been one thing were it a single incident, but the spot re-aired last Sunday as part of a best-of episode and sure enough, not but a few hours later the hooligans pulled the same stunt, rolling the car on its roof. Naturally, Coughton needs someone to blame, so in this case it's Clarkson, who he says, "It might all be a laugh for Mr Clarkson but believe me this is not funny for me – I've been vandalized and nearly ended up in hospital. Robin Reliants do flip quite easily and the last thing yobs need is someone showing them how to do it. His schemes are ridiculous, irresponsible and dangerous." The BBC has issued a canned "We do not condone these actions." statement, but really, it's nothing to do with Clarkson, or Top Gear. Blame the hooligans, not the world's most popular motoring show.